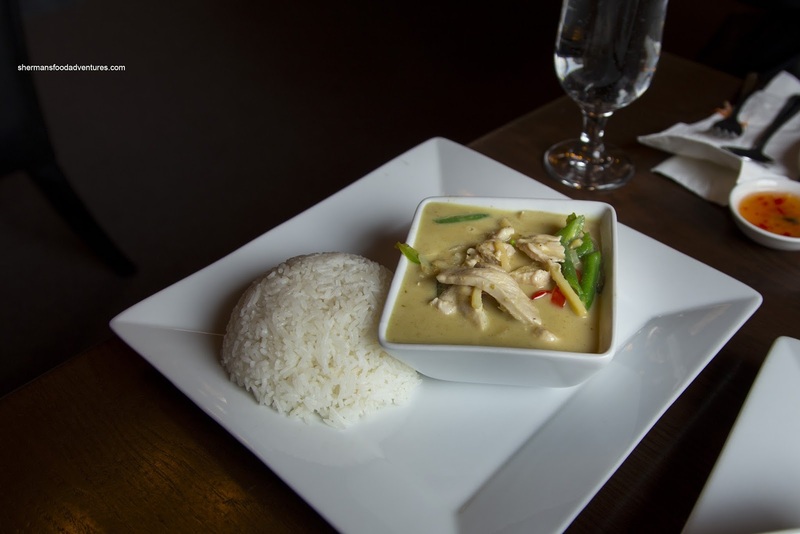 Have you even noticed that there is an inordinate amount of Thai restaurants in and around the New West area? Well, I wouldn't classify it as a bounty of Thai restaurants, rather, there are quite a few considering the population size and demographics. It's just like the amount of Japanese restaurants in Ladner. 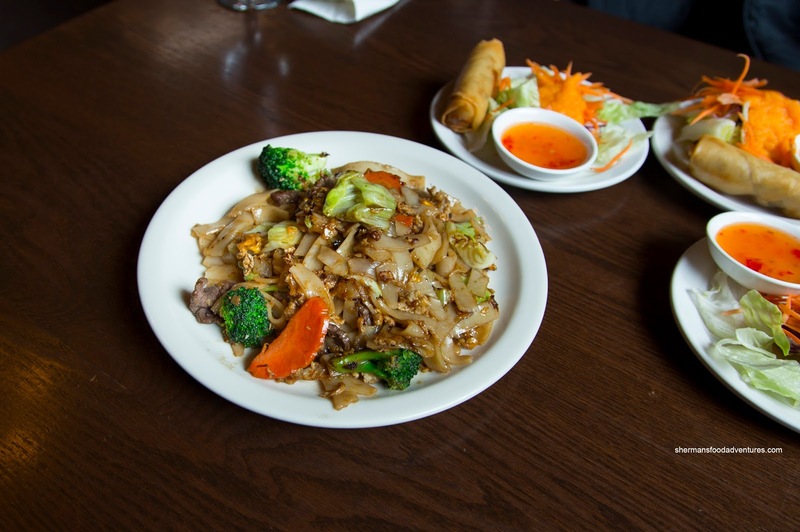 There really is not rhyme or reason, but heck, I like Thai food, so why am I even talking about this? Big D and I met up with Slick at Patsara Thai situated in a non-descript building that could pass for anything but a restaurant. 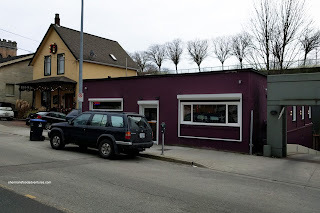 They don't even have any signage other than the name in the window. Since we met for lunch, we took advantage of their specials and ordered 4 dishes to share. With each, a Spring Roll and Green Salad were included. 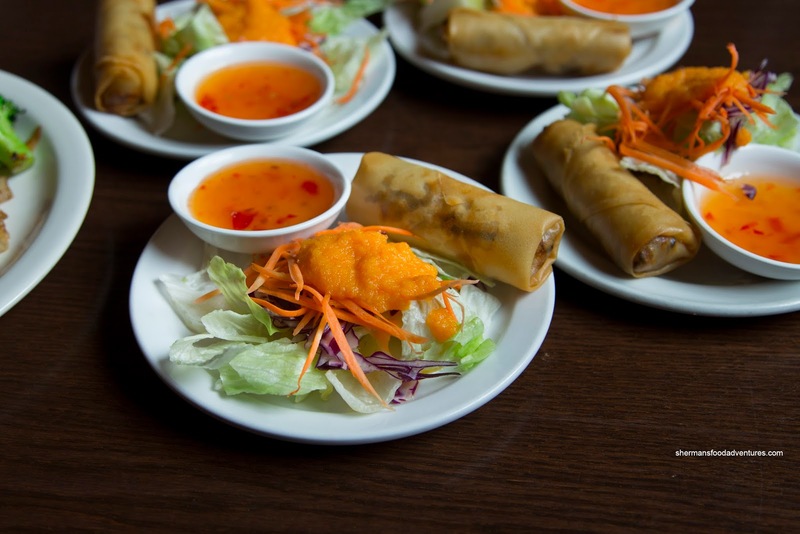 Nothing particularly amiss with these 2 items as the spring roll was hot and crispy with a veggie filling that was just the right density (not wrapped too tight or too loose). The salad was a salad, but was fresh and topped with enough sweet and tart dressing. We ended up with 2 curries starting with the classic Green Curry with chicken. Normally, I find Thai curries to be mostly sauce with very little meat and ingredients. Thankfully, this was not the case here (even though it was a lunch special). There was a good ratio of chicken and veggies that made the dish fulfilling. With that being said, the chicken was a bit on the drier side. Flavours were pleasant, if not a bit sweet. I would've like to see more spiciness. 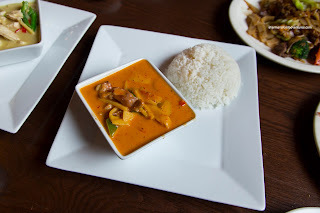 We also got the Red Curry with pork and it was a bit more impactful. Again, there was enough ingredients to call it a meal where the pork was more tender than the chicken. Again, the amount of palm sugar was noticeable, but at the very least, it was balanced by the spice level. 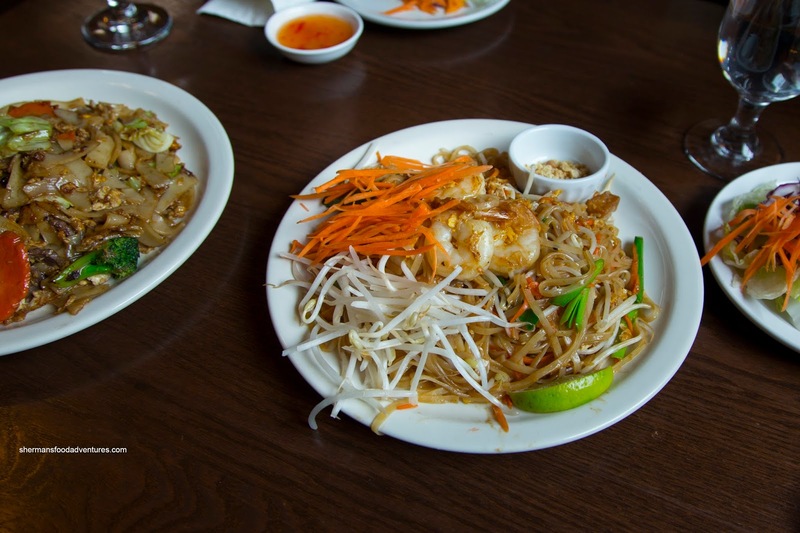 Our other 2 dishes were noodles including Pad Thai with shrimp. This was pretty traditional with pressed tofu, pickled turnip, peanuts, sprouts, lime and large shrimp. I found that there was a good amount of wok heat to create caramelization (hence sweet again), some smokiness and a dry enough (in a good way) chewy noodle. I would've enjoyed more tang, but the dish was not devoid of flavour though. Textures were all on on point. Our second noodle dish was the Pad See Ew with beef (cover all the meats right?). Like the Pad Thai, the noodles were appealingly chewy with a good sear from the wok heat. Flavours were surprisingly mild (which was fine by me as this dish can be salty) and the amount of beef was generous. From this small sample size, this was enough evidence for us to plan a return visit. Can't beat good food at reasonable prices.